Congratualations to Stephanie Whetsel (of Clemson University) for winning the straw poll for morning madness. Her talk, entitled, “Pedestrians’ Estimates of Their Own Visibi- lity at Night Are Not Reduced When Head- lights Are Severely Weakened” made entertaining use of video clips and was an audience favorite according to the poll. A big thanks to everyone who participated with hilarious and entertaining presentations. Until next year! Will you be at the Human Factors and Ergonomics Annual Meeting in September? If so, and you are presenting, consider doing a 25-second madness presentation. The theme of “madness” is very appropriate for the conference locale: Las Vegas! This year the madness presentations will be right before the opening plenary so you’ll have a huge audience. The purpose of madness is to advertise your talk, panel, or poster. During the conference we will upload a gallery of images from that session. HFES will hold its second “Early-Morning Madness” presentations at the 55th Annual Meeting in Las Vegas, offering exciting 25-second previews of full HFES sessions. This may sound like an impossibly short amount of time to present your work, but we promise that it will be fun and informative. 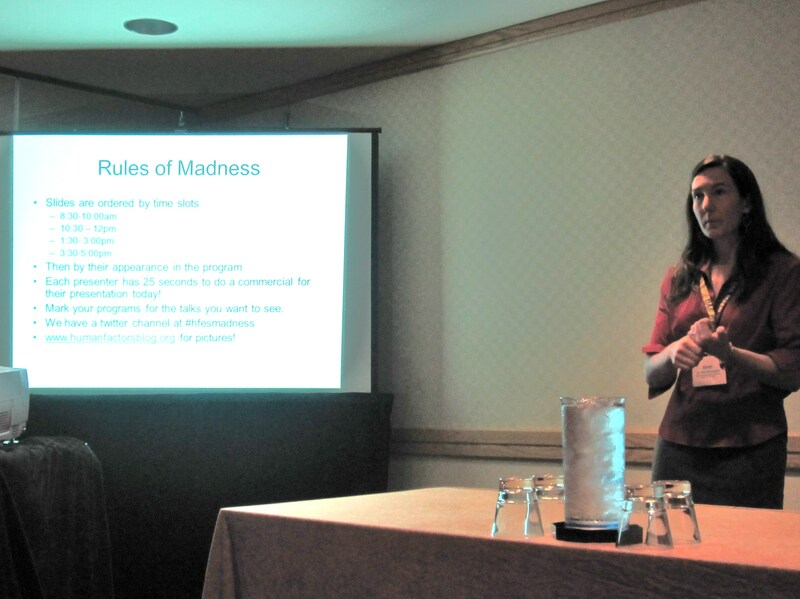 If you are presenting a paper at the meeting, we encourage you to participate in the Madness session. We had a great time last year and are looking forward to applying all that we learned to make Madness even more informative and exciting! In general, you will present a single slide and have 25 seconds to advertise your talk. You can even show a video, as long as it is 25 seconds or less in length. Feel free to be creative! If you exceed the time limit, we will stop you at the 25-second mark, and the next person will walk up to the microphone and begin. Your goal should be to give just the right amount of information so audience members will want to attend your full talk. All authors will receive an e-mail containing the schedule, details, and requirements for Madness presentations. If you have any questions, please send an e-mail to HFESmadness@gmail.com. Don’t miss this chance to advertise your talk—take part in the Madness! The Human Factors and Ergonomics Society is announcing the Human Factors Prize, a $10,000 prize recognizing excellent human factors research. The winner will be presented at the annual meeting in Las Vegas this fall. The Human Factors and Ergonomics Society is proud to announce the Human Factors Prize, established in 2010 by Editor-in-Chief William S. Marras. The prize, which will be presented for the first time in 2011, recognizes excellence in HF/E research through an annual competition in which authors are invited to submit papers on a specific topic for that year. The topic is selected by the editor in chief in consultation with a Board of Referees chaired by Immediate Past Human Factors Editor Nancy J. Cooke. See below for the current year’s topic. The prize carries a $10,000 cash award and publication of the winning paper in the Society’s flagship journal, Human Factors. The award will be formally conferred at a special session at the HFES Annual Meeting, where the recipient will present his or her work. The topic for the inaugural-year Prize is health care ergonomics. Health care ergonomics is broadly defined to include research at the intersection of health care and human factors. Suitable sample topics include human factors aspects of home health care, the ergonomics of laparoscopic equipment and procedures, patient care coordination, usability of electronic health records and informatics, macroergonomics of health care facilities, and use of simulation for health care training. Dr. Ron Shapiro received his Ph.D. from Ohio State University. He has had a long career in human factors, including being a visiting Assistant Professor at Denison University, consulting for three years with Dunlap and Associates, and then spending 23 years at IBM in their Large Systems Group, Software Group, and in Corporate Learning and Human Resources. He has taught as an Adjunct Assistant Professor at the University of Conneticut, Dutchess Community College, and at Marist College. He is currently an independent consultant in Human Factors and Human Resources. Anne: Hi Ron, would you briefly describe your job and what you enjoy most about it? Ron: Right now, my favorite activities are introducing Human Factors/Ergonomics to students, faculty and to organizations and helping to grow our profession. This includes consulting on career planning for students and offering recommendations on how to solve problems. An advantage of being on my own is that I get to do work that I want to do. Anne: That’s a nice advantage. So, how did you get interested in Human Factors as a career? Ron: As an undergraduate I was interested in people (psychology) and computers/information processing. A graduate associate recommended that I look into Cognitive Psychology, which I did. While I wanted an academic appointment when I graduated, they were few and far between for Cognitive Psychology. A number of the graduate students at Ohio State were taking applied jobs in Human Factors, so I decided to learn more about HF. One very valuable discussion which I had, that actually became a turning point in my career, was with Tom Eggemeier at the University of Dayton. As I learned more about HF from Tom and others, I found that I was very much in demand in the applied world (after a year of getting mostly academic rejections I received numerous job offers without even filling out applications!!!) Indeed, I was not prepared for this level of success, and as I think back about it I probably could have managed the success better. Anne: It sounds like you have gotten to do a number of different things in your career. What skills do you need the most for your current job? Ron: Listening to people and drawing on the human factors literature, experiences which colleagues, many of whom I have met through HFES and APA Division 21, have shared with me as well as my own personal experiences to propose solutions to problems. Anne: Could you share an example of how you’ve seen HF make a difference in the world? Ron: Actually, the example I’ll give is of something I have not seen. Neither has anyone else, but I can certainly imagine it: The number of accidents/injuries/deaths which have been prevented through HF Design. I think about it whenever I’m going to do something significant like ride in an airplane. Anne: If you could tell an undergraduate psychology major about opportunities in human factors, what would you say? Ron: Actually, I do this very frequently both formally and informally. My next formal address on this will be at the Eastern Psychological Association (EPA) Conference in Boston in March. First, I highly recommend the career for individuals interested in both people and technology. The advantages are that it is interesting work, there are very good opportunities for internships and jobs, and they are high paying. Now, the disadvantages are that you will need to live where the jobs are and you won’t necessarily know whose life you saved. Anne: Good summary! Undergraduates frequently tell me that they want to help people, but they imagine that as a 1 on 1 job, rather than creating systems and products that help a large number of people, as you describe. I saw from the HFES site that you have been on a number of panels on that very topic. Ron: Yes. I agree with you. I have also found that students do not think of careers in prevention as a means of helping people — probably more people than they could ever help in a treatment role, but anonymously. I began to work in the career development area for HF students and professionals years ago when I observed that students needed guidance from professionals with experience working in government and industry. In 1996 Tony Andre, who was also doing significant work in this area, and I decided to work together on HFES Career panels. We traditionally offered these on Tuesday afternoon at the HFES meeting immediately before the student reception, but last year we decided to team with Sandra Garrett and move these to Student Career Monday. By coincidence, this year Tony is the President of HFES and I’m the Secretary-Treasurer, so Tony and I have the opportunity to work together in a new capacity. Tony is currently on a two-year leave from the Career panel organization to serve as HFES President. Anne: I know you are heavily involved in organizations like APA, especially Division 21, and HFES. Can you tell me why that is a priority for you? Ron: First, our success as individuals and as a profession is in part highly dependent upon our developing a market for our services and developing future as well as current members of the profession is critical to our growth and survival. I believe that in order to be a profession we need to communicate with each other both personally and technically… transcending corporate boundaries for our entire career… not just until we graduate from school. Professional societies are critical to doing all of the above. While the internet is useful, without an organized structure its utility is limited. Anne: Many of us have heard about your Games to Explain Human Factors: Come, Participate, Learn & Have Fun!!! Outreach Program. How can we learn more about it? Ron: You might check out the Games website. The 168 page program is available free to HFES and APA Division 21 members and teachers upon request. Anne: And finally, how can one arrange to have you speak or consult? Ron: Just send me an email: DrRonShapiro1981 at SigmaXi.Net or call. I’d be pleased to work with you. 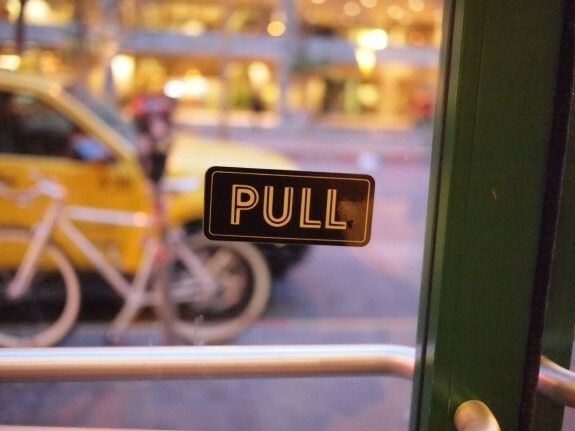 As we took the picture of the PULL sign, a woman came up behind us to exit. Trying to help her, Rich naturally reached out and pushed on the door. HFES madness continues at the annual meeting in San Francisco. Visit the site to see the pictures. The annual Human Factors and Ergonomics Society meeting is next week in San Francisco. If you’re attending as a presenter (of a lecture, a poster, or a symposium), consider participating in the HFES Madness Sessions! These new sessions (organized by Anne, Kelly Caine, and me) are short-burst advertisements for your talk. We’re borrowing this idea from our friends at SIGCHI. At 25 seconds long, there is definitely room and it’s not too late! If you want to participate, just send your name and a slide to HFESmadness@gmail.com. Information about each madness presentation will be posted to a dedicated website and Twitter. To participate, please prepare a single slide in PowerPoint or as a pdf. Your slide will appear on screen for 25 seconds. Or, you can even show a video, as long as it is 25 seconds or less. Feel free to be creative! At CHI 2010, presentations included everything from a research rap video to a limerick that summarized research findings. If you don’t have PowerPoint, we suggest you go to http://www.openoffice.org, where you can save your presentation as a PowerPoint file. If you submit a video, it must be a WMV file and must not be longer than 25 seconds. Are you going to the annual Human Factors and Ergonomics conference this fall? If you are conference presenter or just browsing, make sure to stop by the Madness sessions. The purpose is to get a fun 25-second preview of the talks happening that day. It’s early in the morning but hopefully well worth it. We’ll host a concurrent website and Twitter feed so that the audience can discuss the presentations. The website will contain short summaries of each madness presentation as well as a live picture as it happens. HFES is introducing fast-paced “Early Morning Madness” presentations this year at the 54th Annual Meeting in San Francisco. These sessions will offer exciting 25-second previews of the full talks to be given later that day. This may sound like an impossibly short amount of time in which to present your work, but it promises to be fun and informative. If you are presenting a paper at the meeting, we encourage you to participate in the Madness session that will take place the morning of your presentation. On Tuesday, September 28, the session will take place from 7:00 to 7:45 a.m., prior to the Opening Plenary Session. Wednesday through Friday, September 29–October 1, Madness sessions will take place from 7:15 to 8:00 a.m. The sessions start early every morning of the conference (hence the “madness”) so get your coffee before you arrive!